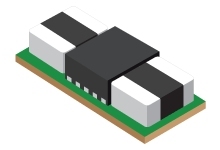 The TPSM82480 is a synchronous step-down DC-DC converter module for low profilepoint-of-load power supplies. The input voltage range of 2.4 to 5.5 V enables operation fromtypical 3.3-V or 5-V interface supplies as well as from backup circuits dropping down as low as 2.4V. The output current is up to 6 A continuously provided by two phases of 3 A each, whichrun out-of-phase, reducing pulse current noise significantly. The TPSM82480 provides an automatically entered power save mode to maintain highefficiency down to very light loads. This incorporates an automatic phase adding and sheddingfeature using both or only one phase according to the actual load. The power save mode can beswitched off using the MODE feature. The device offers a Power Good signal and an adjustable soft start. Also, the devicefeatures a Thermal Good signal to indicate excessive internal temperature. The output voltage canbe changed to a preselected value by VSEL pin. TPSM82480 is able to operate in 100% duty cyclemode.